This document is a transcription of these scans. The Atlas Autocode Reference Manual was printed on a Flexowriter printer, and by using Flexowriter-specific characters as well as overprinting, has quite a number of non-ASCII characters in it. HTML entities are used for the following characters: Σ for Sigma, ² for squared, ½ for half α for alpha, β for beta, π for pi, θ for theta ≠ for noteq, ≤ for leq, ≥ for geq, ≡ for equiv, ↑ for powers, ± for plus/minus, ø for slashed o.
expected that they will be described with reference to this manual. which describe in algebraic notation the calculation to be executed. 'compiled' can it be executed. which are to be punched and presented on a data tape in this order. Σ(Yi - aXi - b)².
it must be separated from the previous statement by a semi-colon. program as in the above example, end is replaced by end of program. structure notation will be found in Appendix 1. = > < | * : , ' & ² / . + _ ½ ( ) [ ] ? The last of these consists of an asterisk superimposed on a vertical bar . it is equivalent to ↑2. conventions for exponents will also be used in the text. legibility in the written form of the program. Underlined names and mixed names such as RK2ST are NOT allowed. There are certain  names, e.g. log, sin, exp, print, read, etc. names must be declared before any reference is made to them (see below). In future a general name will be denoted by [NAME]. The last two examples mean  1.728  and  10000000.
followed by an optional sign and decimal digits. may be punched as 2½. it is most often used when reading symbols off a data tape (see Section 5). have fixed absolute meanings in the language. by commas is used throughout: See Appendix 1.
which reserves space for three arrays of real variables a(i), b(i), c(i). expression (see later), which determines the particular element. reserves 1000 locations for each of the two arrays CUBE 1, CUBE 2. Storage allocated by all the above declarations has dynamic significance, i.e. on block structure and dynamic storage allocation (see later). Each argument can be an arithmetical expression (see below). The last three functions are of type integer (see later), the rest of type real. that the argument of the last must be of type integer. A complete list of standard functions is given in Appendix 2.
and an [OPERATOR] is one of + -   / ↑   (the asterisk denoting multiplication). ab were declared. In this case a fault (NAME ab NOT SET) would be indicated. the fifth example means a * (b/c) * (d/e). [EXPR]. Thus it is equivalent to mod([EXPR]). exp(b*log(a)),where a must be positive. integer constants or integer functions (e.g. int, intpt, or parity). integer [VARIABLE]'s the following are integer [EXPR]'s. to B-registers without using the floating point accumulator. the computed value of the [EXPR] in the location allocated to the l.h.s. that y had an integral value. of other operands in the same block. if it reaches that point. may only refer to labels within the block (see later). traversed n times, with i successively taking the values 0,1, ...,n-1. After the final cycle, control goes to the statement following repeat. may be altered without affecting the number of times the cycle is traversed. must be a positive integer or zero otherwise a fault is indicated. where i has keen declared integer and x real. program and to start obeying it from the first instruction. the dynamic end of the program; its action is to terminate the calculation. in the pagination of programs. writing comments and possibly long algebraic expressions. can be used to return the compiler to its normal operation. a fuller description being given in the section on the use of machine instructions. next available location i.e. it contains the address of the next free word. to variables are indicated by the presence of the name given to the variable. causes St to be advanced(either explicity or implicity) still further. Finally when end or end of program is reached, then St reverts to St1. because the amount of storage space required can be determined at compiler time. reserves space for all the fixed variables. begin, St assumes its original position, St1. taken to refer to the variable of that name declared in the outer block. in the outer block to a variable declared in the inner block. and in any sub-blocks unless redeclared in the sub-block. between statements of the same block. control to the first instruction of the program. from tape, each array being preceded by its dimensions. particularly for very large values of m and n.
each of which represents some characteristic part of the calculation. and their design and use is a fundamental feature of the language. where the coefficients are selected from some vector a.
elements a(i), it evaluates the polynomial and sets y to this value. can be omitted; in this case end serves for both purposes. 1:   There can be any number of alternative exit points in a routine - i.e. return can occur more than once. are the ACTUAL PARAMETERS (see next section). the declarations at the head of the main routine and the bodies at the end. for the formal parameters whenever the routine is used in the main program. routine                           |      name of a routine as a parameter. a real variable. The formal parameter then is of type real name. the non-local array whose name is substituted for a in the calling statement. called by NAME (such as x and a). arrays should be called by NAME if at all possible, especially if they are large. the value of the function. to return in a routine), and may appear any number of times within the function. and the various routine specifications. the routine or block outside that and so on until the main block is reached. name is not found in the main block it is looked for among these. material for controlling the entry to and exit from the main block. referred to as its 'textual' level. etc. and the basic input/output routines read, print etc. is given in Appendix 2. ACTUAL PARAMETERS IN PLACE OF FORMAL PARAMETERS OF ROUTINE TYPE. to be translated, a specification of the formal parameter f is required. of the function is given explicitly by the formal parameter itself. followed by 1000, using for n the integer nearest to 10b. main program, but they must correspond in type. so that there will be no confusion between variables on successive calls. recurrence rather than recursive techniques. information and be able to refer to it on a subsequent entry to the routine. This may be accomplished by prefixing the relevant declaration by own. own array declaration must have parameters which are integer constants. described and the precise form of data is given. another 'select input' instruction is encounted. by an optional number of spaces, an optional sign, and the decimal digits. indicated if a number assigned to an integer variable is not integral. are irrelevant and the number is terminated by the following name or delimiter). hence the subscript of X(i) takes the value just assigned to i.
it may have an indefinite number of real name and integer name parameters. passes over the next symbol without reading it. of compound symbols is given in Appendix 5.
by using the internal equivalent. exit from the routine, n contains the number of numbers that have been read. would cause the successive numbers to be read into X(1), X(2), etc. when the routine was left. length, sections of 160 characters being taken serially. which is replaced by a space if it is not significant. device is a line printer, or punches 30 newline characters if it is a punch. on the punch. It has no effect if the output is on a line printer. numbers is the same as that of the 'print fl' and 'print' routines. terminated by 'semi-colon' not 'newline'. between the digits of value 4 and 8), and places it in the named variable. 5 or 12 digits rather than 7.
these faults information is automatically printed out where a fault occurs. its serial number, for use in tracing faults found at run time (see later). lines are ignored, and lines joined by the continuation symbol c count as one. 115. Finally label 18 was not set in the routine POLY. in Appendix 4 together with a brief description of their nature. both by the compiler and by the machine and its supervisor program. faults connected with switch and test instructions. as) a floating point quantity (probably zero). if the current routine does not alter them. name used on the left hand side of the instruction at the time of the fault. same 'CURRENT VALUE' - the current value of i. 3:    Only cycles, arrays, integers and reals are distinguished. is printed (as an integer) . (ii) for array fn's (see Section 9) its parameters are printed (as integers). 'case' in the event of (say) EXP OVERFLOW rather than terminate the entire job. if a fault of type 3 or 4 occurs then jump to label 10.
one of the specified types of faults occur at some lower (or the same) level. usually be in the 'main' block at (say) level 1 or 2.
the program to be terminated). can be trapped and the corresponding fault numbers. switched on or off at run time by means of instructions in the program. the program in which provision is to be made for the particular checking facility. printed every tenth time round the cycle. They will be described in turn. a = b(i) + c? program is terminated with the appropriate monitoring. 'Documents and Job Description' I.C.T. Ltd., October 1963.
to the amount of output that is to be permitted. blocks used by the program and data. 'INSTRUCTION' is equivalent to 2048 machine instructions. its own, and must be followed by at least one 'newline'. convenient to keep the program on a separate tape which is never changed. channel) and SELF = 1 indicates that the data tape is to be read as channel 1.
since this is the part of the job description. unmanageable to keep it on one tape. be kept on a separate tape. that of the real part. All quantities must be declared before they are referred to. have complex  [EXPR]'s as arguments and yield results of complex type. Here i is a delimiter denoting the i (or j) of complex algebra notation. quantities may not appear in real or integer expressions. be used on the l.h.s. of an instruction (whose mode is then real). The routine types [RT] have also been expanded to include complex fn. assuming x and the coefficients a(i) to be complex. routines, 'print' and 'print fl', using the same digit layout parameters. they may only appear after an α (see description of basic input routines). have not been generalised to deal with complex numbers. terms of an origin s and a dimension parameter p.
The parameters in array functions may lie general integer expressions. and A(0,0) would correspond to address s1. the origin in the array function declaration. x(1), y(1) or a(1), a(2), the second by x(2), y(2) or a(3), a(4) etc. x(i), y(i) can be accommodated. to A(2,1), - - - -,y(10) to A(10,1). statement appeared. Such a function may also be employed on the l.h.s. In the same way we can also define integer map and complex map routines. stack. We illustrate this with reference to the following routine. advanced again to the final value shown. of the address can be used in machine instruction formats(see later). variables) by single words, namely their addresses, in a destandardised form. words, representing the real and imaginary parts. Arrays of k dimensions (>2) are stored in hierarchical fashion. to a set of k - 2 dimensional arrays, and so on. 4. THE PARAMETRIC FUNCTION F.   Six words of information are kept here. further details see the Compiler. the execution of the cycle. The diagram illustrates how they are stored. Some 'machine code' formats are now described. 4. We now have an instruction format which uses a symbolic address. assuming Bd ≡ B2, and that F occupies 6 words. The effect would be to put a in the accumulator. would load the imaginary part. In Section 5, we decribed the input and output routines. These set A to B*C, B*C' and B' respectively where the ' denotes transposition. sets 'det' to the determinant of B and destroys B.
from x to x+h, using the Kutta-Merson fourth-order integration method. and x and then place them in f(1),f(2), ....., f(n). advances the solution by a single step of length h of the Kutta-Merson process. Differential equations. Pergamon 1962, P.24. contain the solution at x+h. h       the increment of the independent variable. n       the number of equations in the system. an estimate of the maximum truncation error over the step. the error is less than .01e then the step length is doubled. contain the solution at x1. x0      the inital value of the independent variable. x1      the final value of the independent variable. at a general point(see above). by any member of the class. We call an entity in square brackets a PHRASE. elsewhere we mean that any of the ten will be legitimate. are examples of switch limits. Alternatively we can use the special ? qualifier as follows. explicity giving the latter definition. its own in an Autocode program. 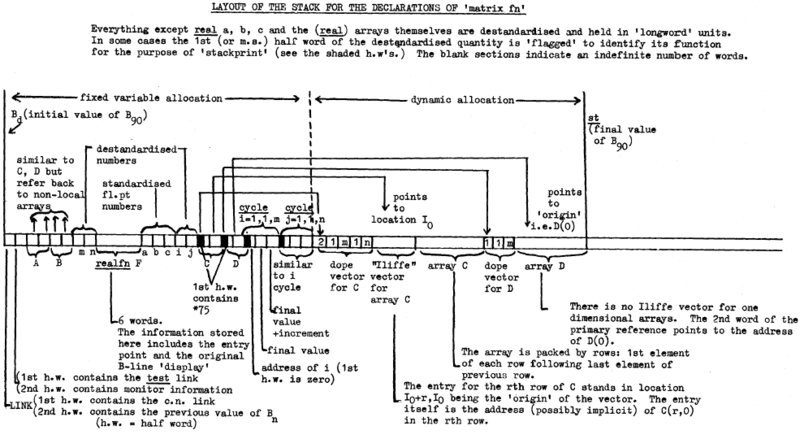 A list of the phrases and formats of Atlas Autocode follows. Note that some phrases ([S],[CONST],[NAME] and [TEXT]) are not formally defined. but those interested may refer to the references given below. Computer Journal, Vol. 5. No. 1.
. Brooker,R.A., MacCallum,I.R., Morris,D. and Rohl,J.S. they are described more fully. parameter in a routine call, since they are implimented in a different way. Fault monitoring is very dependent on the form of the compiler used. 1. Faults due to [NAME]'s not having been declared. 4. Faults found at the end of each block or routine. the program to be terminated but it may be restarted by a fault instruction. appearing, reference should be made to the ABL Manual. or α) appears in data. has been encounted in textual data. or corresponds to a missing label. ARRAY DIMENSIONS NOT +VE        Refers to a bound pair (L;U) where U-L+1≤0. single (upper or lower case) character. order of punching the individual characters. No complex. Ignore all references to same. No test - case. Use a sequence of conditions. No routine or jump tracing. No distinction between real....and integer [EXPR]s.
No array or integer array formal parameters. No maps, array fns, own variables. New program map and stack print,  see attached examples. A detailed (but incomplete) list of textual alterations follows. ''a² or a↑2 is compiled as a*a. 2.9    CONDITIONAL LABELS: delete this section. 4.9    OWN VARIABLES: delete this section. the first line of program is line 1.
contain the current line number. instructions (see section 10.1a)*. Initially B2 = 0. ''PHRASE (CR) [program] = programme, program"